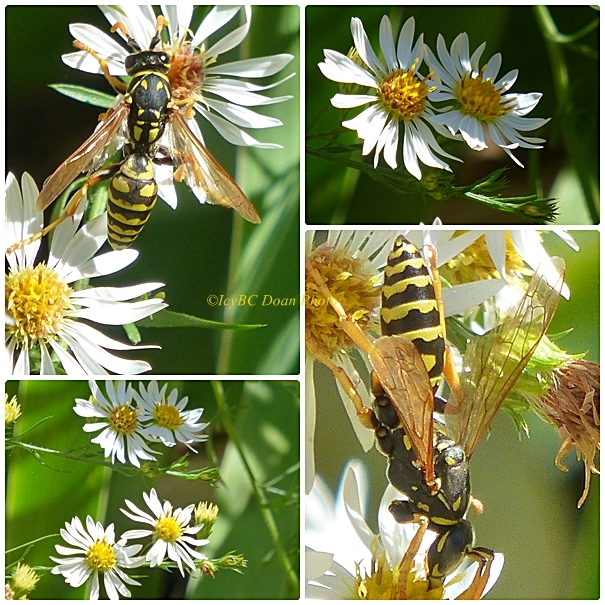 These pretty white asters were the last blooms around the yard, and the wasp enjoyed them to the end. Overnight with temperature plummet into the twenty, every thing turned brown and closed up. It's time to say good bye summer, autumn, and hello to winter whether I am ready for it or not. So am I right to say, welcome, winter. A great collage with excellent macros of the wasp! I love autumn and winter...I'm ready! Lovely mosaic showing the very last blossoms of 2013. Ja jeszcze nie tęsknię za zimą, ale ona i tak przyjdzie. Teraz się ciszę Twoimi kwiatkami i osami. Pozdrawiam. I still do not miss the winter, but she still comes. Now the silence of your flowers and hair. Yours. Beautiful captures for the day!! I love the wild flowers!! Have a lovely week! brown and brittle... it is time... and soon blue and iced with crystals that shine. The daisies are so pretty but those wasps give me the ibby-jibbies. 2 weeks ago I stepped on an earthen wasp nest and was stung at least 12 times go my face and left arm and hand. They are beautiful fellows when in a flower bloom, but not when they are in the ground, Pretty post. The asters are pretty. Lovely photos! Have a happy week ahead! Let's hope the winter doesn't go on and on as it did for us last year. Gorgeous shots of the bees and flowers. What lovely shots. It was so warm here over the weekend that we had a wasp in the house. Very pretty- but I hope we aren't going to completely skip fall- I am so not ready for wet and cold winter. what a beautiful picture to say goodbye to summer.